London is the capital city of England and the United Kingdom, and the most populous city in the European Union. London is one of the world's major business, political and cultural centres. It is a leader in international finance, politics, communications, entertainment, fashion and the arts and has considerable influence worldwide. It is widely regarded as one of the world's major global cities, and has been an important settlement for nearly 2000 years. London has an estimated population of 7.6 million (as of 2005) and a metropolitan area population of between 12 and 14 million. London has an extremely cosmopolitan population, drawing from a diverse range of peoples, cultures and religions, speaking over 300 different languages. Residents of London are referred to as Londoners. The city is an international transport hub and a major tourist destination, counting iconic landmarks such as the Houses of Parliament, Tower Bridge and Buckingham Palace amongst its many attractions, along with famous institutions such as the British Museum and the National Gallery. London has three main central business districts (CBDs): the City of London, the West End in Westminster and Canary Wharf in the Docklands. The City of London is the largest financial and business district in Europe. The Crowne Plaza Hotel London - The City is located opposite Blackfriars train and underground stations on the edge of the financial district of London, England. The Tate Modern is 500 metres away and Westminster Abbey and the Houses of Parliament are 800 metres away. Housed in an early 20th- century building, the Crowne Plaza Hotel London City is built on the site of Henry VIII's Bridewell Palace. The Spirit Fitness facility offers a range of cardio- vascular equipment and a sauna, and valet parking is available. There are two restaurants available on site; Refettorio serves traditional rustic Italian dishes and Spicers Restaurant serves a variety of regional British dishes. DJs and musicians perform between Wednesday and Friday in the bar, NineteenBelow. The property with its comfortable accommodation and convenient facilities is an ideal base for experiencing an exciting vacation in the city of London. 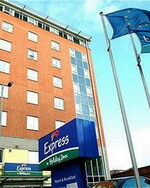 Express by Holiday Inn London Limehouse is located in the heart of London's dynamic Docklands area and is only minutes from the financial district of Canary Wharf. The Limehouse DLR station is located only a short walk from the hotel, allowing convenient access to the excel exhibition centre and London City Airport. The hotel features 150 contemporary style air-conditioned bedrooms offering guests a comfortable, warm and friendly stay. All the bedrooms have en-suite facilities and are gracefully decorated to create a cosy atmosphere. Guests can dine at the onsite restaurant that serves a wide variety of delicacies. The pleasant ambience of the bar makes it a perfect place to unwind with a refreshing drink. Located in South West London on the border of Fulham and Chelsea, the contemporary La Reserve Hotel has a white façade and is situated 700 metres away from Chelsea Harbour and one kilometre from the popular shopping street, Kings Road. 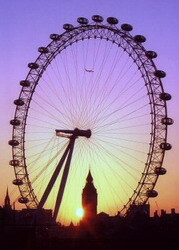 Heathrow Airport (LHR) is 22 kilometres from the hotel, with an approximate driving time of 30 minutes. The hotel offers a contemporary bar, with modern art on the walls and leather sofas for total relaxation. La Reserve Restaurant serves breakfast, lunch, and dinner, featuring a comprehensive cosmopolitan menu, with seating for 50 people. The hotel offers a conference room, bookable in advance, with boardroom-style seating for up to 30 and cinema-style seating for up to 60. Parking at the hotel is free (subject to availability), and wireless Internet is available throughout public areas. 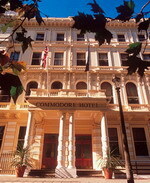 Originally constructed in London, England in 1860, the Commodore Hotel reflects the graceful architectural lines of the Victorian era. This hotel stands along a tree-lined square adjacent to Hyde Park, and is positioned one kilometre from Portobello Market. This former townhouse displays Victorian antiques throughout the hotel. High tea is served in the lobby lounge, which is the focal point for the hotel's antique collection. This property serves continental breakfasts each morning (surcharge). 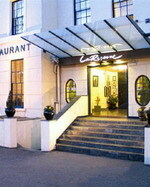 Lancaster Gate Restaurant prepares English and Mediterranean fare, including Spanish tapas. The Red Bar displays traditional British ambience with leather sofas and deep-crimson walls hung with historic black-and-white London scenes. The bar serves an extensive selection of fine wines. A complimentary 24-hour fitness room houses full-length mirrors, free weights, a rowing machine and a treadmill. Club Quarters St. Paul's is tucked within historic Stationers Hall in the business and financial district of west London, England. 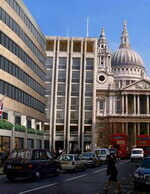 The property stands adjacent to St. Paul's Cathedral. Tate Gallery of Modern Art and the New Millennium Bridge are positioned less than two kilometres from the hotel. Access to this property is restricted to guests only. Marble pillars, gracious floral arrangements, warm colour schemes and intimate seating arrangements present an elegant setting in the hotel lobby. Perc%nto offers an upstairs casual bistro and cocktail lounge, while the downstairs level is an Italian restaurant. Reception and concierge services are available 24 hours a day. A computer is housed in the Club Room and is equipped with complimentary high-speed Internet access. Wireless Internet access is available throughout the hotel. Complimentary hotel amenities include weekday newspapers, games and magazines. 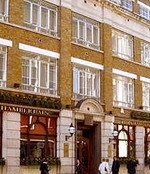 The Chamberlain Hotel is a former townhouse positioned along a main thoroughfare in London, England. Tower Bridge, the South Bank and the Design Museum are located one kilometre from the hotel. The hotel exterior typifies British design with window flower boxes and white-brick columns. On-site dining is offered at Chamberlain Restaurant which is open daily for breakfast, lunch and dinner. Modern European cuisine headlines the menu. Chamberlain Bar offers beverages and bar fare. The hotel provides wireless Internet access is available in public areas for a fee. A business centre offers fax and photocopy services. The Chamberlain Hotel offers discounted passes to a nearby health club. 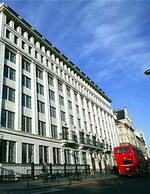 A Grade II listed building, the Renaissance Chancery Court is a grand, seven-storey Edwardian hotel located 500 metres from Covent Garden and West End theatres, and half a mile from the British Museum. The hotel houses 11 meeting rooms, the largest of which can accommodate 400 people theatre-style. The business centre offers secretarial and support services, including fax and photocopying facilities. At the onsite spa, guests can unwind in the teak and gold-leaf relaxation room or sweat it out in the steam room and sauna. Ayurvedic and holistic therapies include traditional manicures and pedicures, and hot stone massage. 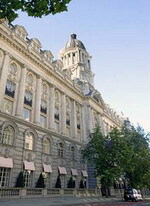 Situated in one of the original banking halls, the Pearl Restaurant features marble columns and high ceilings. The à la carte menu offers modern European fare with an Oriental twist, and signature dishes include Rabbit Ravioli. The Bar at Chancery Court features mahogany panelling, green-leather sofas, and comfortable armchairs, and offers a lunch menu and bar snacks in the evening. 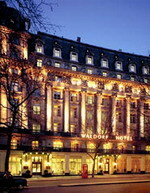 The Waldorf Hilton is strategically located between The City financial district and the West End in London, England. This property is bordered by two major West End theatres, and stands one block from Somerset House and two blocks from Covent Garden and the Thames River. Constructed of Aberdeen granite and Portland stone, The Waldorf Hilton has anchored the west crescent of the Aldwych since 1908. The Waldorf Hilton's splendid lobby leads to the Homage Grand Salon Restaurant. This distinguished restaurant features Louis XVI style and a walk-in wine cabinet. Menu highlights include traditional and contemporary favorites, a grill selection and daily regional European specials. A unique, pressed-metal entryway opens onto the Homage Patisserie, the site of morning coffee service and afternoon tea.